WASHINGTON — Traffic deaths surged about 8 percent in the first nine months of last year, continuing an alarming upward spiral that may be partially explained by more Americans on the roads due to the economic recovery, according to National Highway Traffic Safety Administration estimates released Friday. The sharp increase comes as drivers are putting more miles on the road than ever, the government said. But the rise in deaths is outpacing the increase in travel. Vehicle miles traveled in the first nine months of 2016 rose about 3 percent. There were 27,875 deaths in the first three quarters of last year, compared to 25,808 deaths in the same period in 2015. Experts believe the increased travel is mostly a result of an improved economy and low gas prices. But NHTSA's data experts said increased travel and a better economy alone can't explain the rise in deaths. 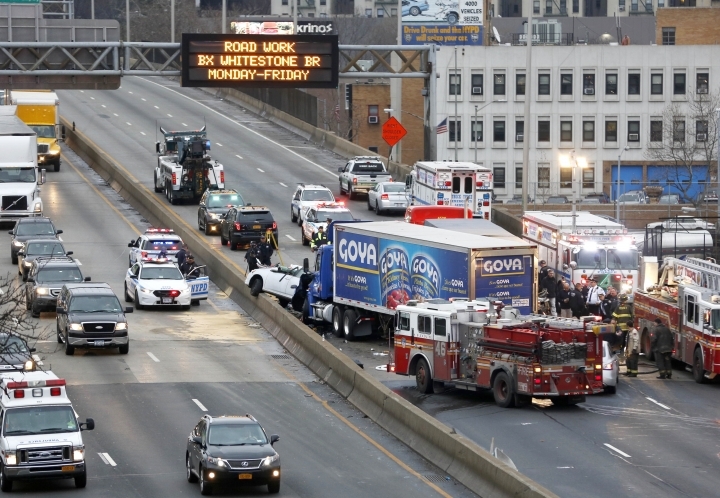 "We still have to figure out what is underlying those lives lost," NHTSA Administrator Mark Rosekind said. "If it was simple, we would already know that." But there are also trends that are difficult to measure, such as increased use of cellphones and other mobile devices behind the wheel. And researchers are trying to tease out whether legalization of marijuana for recreational or medical use in some states may be leading to more stoned drivers behind the wheel and more crashes. It's not an easy question to answer, since drivers high on marijuana react differently than drunk drivers, and there haven't been effective roadside tests for police to determine if a driver is high. Weather is also a consideration, NHTSA officials said. Research shows that traffic fatalities go up in warmer weather months when daylight hours are longer and people do more driving. Warmer than normal winters in some areas of the country may be a factor. In the early to mid-2000s, annual traffic deaths regularly totaled over 40,000 a year. They started dropping sharply in 2008 during the Great Recession, reaching their lowest level in more than five decades — 32,744 deaths — in 2014. But in the fourth quarter of 2014, fatalities started soaring back. In 2015, fatalities rose 7.2 percent to 35,092 deaths. NHTSA found some significant regional differences in the recent fatality increases. In the six-state New England region, for example, fatalities increased an estimated 20 percent in the first nine months of 2016. But in a six-state region that includes North Dakota, South Dakota, Wyoming, Colorado, Utah and Nevada, the increase was only 1 percent. There are also pockets of the country that have had success with efforts to reduce fatalities. New York City, for example, has seen a 23 percent drop in fatalities in recent years. Transportation Department officials announced in October that they were setting a goal of eliminating traffic fatalities and injuries in the United States within the next 30 years. Their plan focuses first on promoting efforts such as increased seat belt use, the use of rumble strips and campaigns against drunken and distracted driving. Ultimately, officials hope that new technologies like cars that can communicate with each other to avoid collisions or self-driving cars that don't make human errors can solve much of the problem. The zero deaths idea was first adopted in Sweden in 1997 as a plan called Vision Zero. It has since been adopted in several countries, and by more than a dozen U.S. cities, including New York.